Maximum altitude: In Seychelles, drones can ascend up to 60 meters (200 feet). Maximum horizontal distance and FPV: Multicopter may only be flown within sight. Once the general visibility is below 3 kilometers, you must not ascend with your drone. Compulsory insurance: In Seychelles, you should fly only with drone insurance. Maximum take-off weight (MTOW): The existing rules apply to UAVs with a take-off mass of no more than 7 kilograms. For heavier models, SCAA approval is required. Distance to airports: To an airport must be considered 15 kilometers (9 miles) distance. For Helipads / Heliports, there is a safety distance of 5 kilometers (3 miles). Thus, it is prohibited in most areas of Seychelles, to raise a drone. Other safety distances: To uninvolved persons, a distance of 50 meters (at take-off and landing 30 meters) must be observed. Major roads, crowds of people (1,000 or more people), private land (if owner’s permission is not available), and populated areas must be 150 meters (500 feet) apart. Vehicles and ships must not approach closer than 300 meters (1,000 feet). Operating Times: Drone flights at night are prohibited in Seychelles. Rules for commercial pilots: To my knowledge, there are no special requirements for business users in Seychelles. You can find more information about our Seychelles video in this article. We have researched the listed drone regulations for Seychelles to the best of our knowledge. We cannot guarantee the correctness of the information. If you want to be on the safe side, contact the competent aviation authority. Alternatively, you can also ask the embassy in your country for further information about the regulations. Please leave us a comment when you receive news and/or gain experience with your copter in Seychelles! Are you aware of any permits that need obtaining? You need the permit if you cannot comply with the distances to airports or heliports I mentioned above. and where is good/safe to fly it to get great photos/video that is outside of the 15km permiter? I’m traveling to the Seychelles with emerites with my dji Mavic Pro and I were wondering if I take the batteries on hand luggage or to put them into the hold, the drone itself goes into the hold?, I’m worried about damage from rough handling, I have a semi hard case which keeps the drone secure and it’ll be in a hard case also. Will customs in dubai take the batteries off me or is there no problems generally?. It’s my honeymoon so it’s important..
You should carry the batteries in the hand luggage. When you fly with Emirates, the drone itself must be transported in the checked baggage. 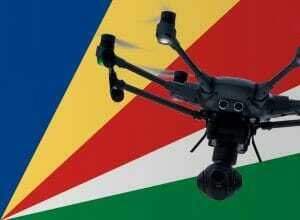 Are you aware of any place in the Seychelles rent drones? I want to rent it for few days during my vacation in the Seychelles. No, I have no idea where you could rent a drone on Seychelles. Hello Im own dron Wingsland S6 must have some permission?